We stopped in Solvang on our way up the coast and what a super quaint little town it is. It was mid afternoon when we arrived, and we were starving so our first stop was a pub. I initially wanted to eat some “traditional” Danish food, but I changed my mind when we found a small pub doing big burgers. I had to have one, and given it was the first burger of the trip I’m glad it was delicious. 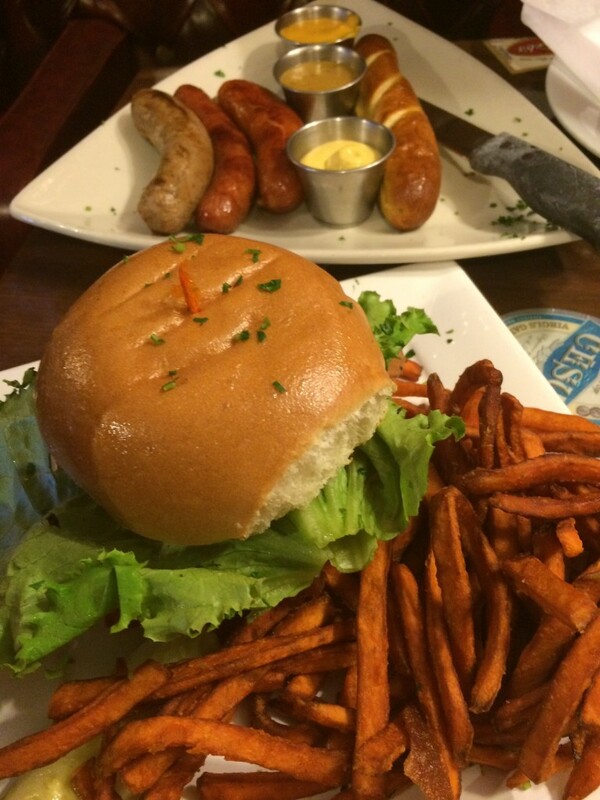 I ordered a beef, bacon, blue cheese burger with sweet potato fries, and Stu enjoyed sausages and a pretzel. The photos are proof that the meals were delicious. It’s a shame that I forgot to take note of which pub it was! With well padded stomaches, we wandered through the tourist shops, admired the architecture and also enjoyed a real hot chocolate and bought some fudge which I hid in the glove box to enjoy later.